an evening with Stan Ridgway & Friends "Songs & Stories"
STAN RIDGWAY & BAND throw a modern "tiki party" of songs and stories at this historic venue. A "calvalcade of hits", new songs and favorites. Exotic? You bet. Advance tickets are on sale at the link! SAM RICHFIELD & his ACID RANGERS w/ THE INSECT SURFERS / a night of Experimental-Psychotic-Outlaw-Country & Surf a' Go-Go at this loose and cozy record store. Holiday cheer! And Evening with Stan Ridgway and Pietra Wexstun "Songs and Stories"
An Evening with Stan Ridgway & Band "Songs and Stories"
An evening with Stan Ridgway and Band "Songs and Stories"
An evening with Stan Ridgway and Trio "songs & stories"
an evening w/ STAN RIDGWAY & BAND / New Songs & Favorites! an evening w / STAN RIDGWAY & BAND / New Songs & Favorites! 2014.08.09 Saturday 8 PM DOWNTOWN L.A.
Tickets on sale at link ! 2011.08.13 Saturday 8 PM - 11 PM DOWNTOWN L.A.
WITH CINDY LEE BERRYHILL ! 2010.01.13 Wednesday 8PM SOLANO BEACH CA. 2009.07.18 Saturday 7PM SAN DIEGO, CA. special guest with DAVE ALVIN & Friends presenting a PETER CASE Hidden Love Benefit Show for Medical Relief. 2007.08.18 Saturday 8PM SEATTLE, WA. 2007.08.12 Sunday 8 PM MILWAUKEE, WI. 2007.08.11 Saturday 8 PM CHICAGO, ILL.
2007.07.29 Sunday 8PM ST. PETERSBERG, FL. 2007.07.28 Saturday 8 PM JACKSONVILLE, FL. The Stan Ridgway Trio will perform as "special guest" of the great PERE UBU at the London's Mean Fiddler on Tuesday Oct. 24th. The Tape Op Magazine Convention and Show 2006 with American Music Club, M Ward, Cracker and more! 9 PM - A BIG PARTY for the great CDBaby.com outa Portland, OR. The SX South Austin Show ! Call 512-447-WIRE(D) for more info. Ridgway's Official SXSW Show. The night is young! "Industry of Music" Show A big hoop-la hoe -down in a hooka bar on 5th St. hey...come on down. Light that Hooka! Stan Ridgway plays several shows at SXSW in Austin TX this week. 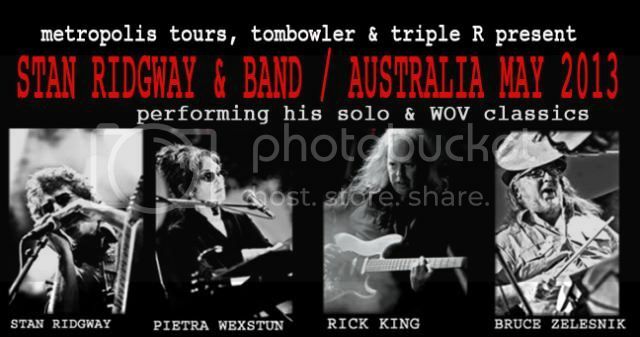 Pietra Wexstun, Rick King, Bob Fierro and Bored Monkey - will be on tour with Stan for this series of shows. 2006.03.15 Wednesday 4:30 PM 715 W. 6th St., Austin. SXSW Guitar Town Show with Steve Wynn, John Dee Graham, The Silos, Will Sexton & Stephn Doster, James McMurty, Willie Nile and MORE! Presented by Lil' Deb and Conqueroo! SXS LAMAR at The Saxon! Mr. Dave Cotton PRESENTS! Enjoy the atmos of Joe's Saxon Pub. The best and friendliest music venue in TX. Stan Ridgway emerged from the L.A. punk - rock scene in the late'70s with his band Wall Of Voodoo, and sometimes he becomes a fairly strange folk singer. He'll do it here with Pietra Wexstun (keys) and Rick King (bass) Old and New will be porformed! Its a NEW YEAR and an All New Show from Stan Ridgway with Band - be there! Big KTHX Radio FREE Halloween Show and Party in Downtown Reno! !! Its gonna be SCARY !! Ridgway's Acoustic Trio plays this historic meeting place of all things FOLK! A big record release show up north for "Barbeque Babylon" - Special guests!! A special BIG SHOW in the land of 3 point 2! Here...Stan brings his band to play ALL the HITS! Don't Miss This! Pereguine Prod. Presents Stan Ridgway and Band in Downtown Boise! A big special show so don't miss it! Record Release Party for DRYWALL's new CD "Barbeque Babylon". Free copy to first 20 patrons in the door. New Drywall swag, posters and novel items of intrigue will also be available for purchase. Smell that smoke? Its Drywall's "Barbeque Babylon"! Put on by Radio Station KTHX in Reno. The Rollin on the River Series at Wingfield Park. It's a free outside summer show! Food and spirits booths and lots 'o swag! This all-new state-of-the-art performing arts venue features live musical concerts. Behind the facade of an historic adobe you?ll find an all-new performance showcase offering lite fare and spirits. the tour that never stops! SXSW Mystery Shows call the police! Ridgway and Band's SXSW MYSTERY MAYHEM SHOWS to be announced. Check the Bulletin Board for updates, rumours and sightings. SXSW LAMAR! A very Special Show for the 10th Anniversery of The Saxon Pub @ 8PM. 2005.01.10 Monday 9 pm Hollywood,CA. All content © Stan Ridgway unless otherwise credited. No Unauthorized Use Permitted.